Central California agriculture and many associated industries will be on full display next week when Denair High School celebrates Ag Day. Parents and community members are invited to come to the campus April 18 beginning at 8 a.m. An estimated 40 vendors from the region will be on hand representing many diverse aspects of agribusiness – tractors and farm equipment, ag mechanics, livestock and animal feed, the plant and nursery industry, dairies, hogs, nuts, and irrigation. There will be a booth highlighting Denair’s historical connection to agriculture. Non-ag careers in firefighting and law enforcement – including members of the Modesto Police Department K-9 Unit – also will be represented. Members of the Coyote Cups of Kindness program will be on hand with refreshments. 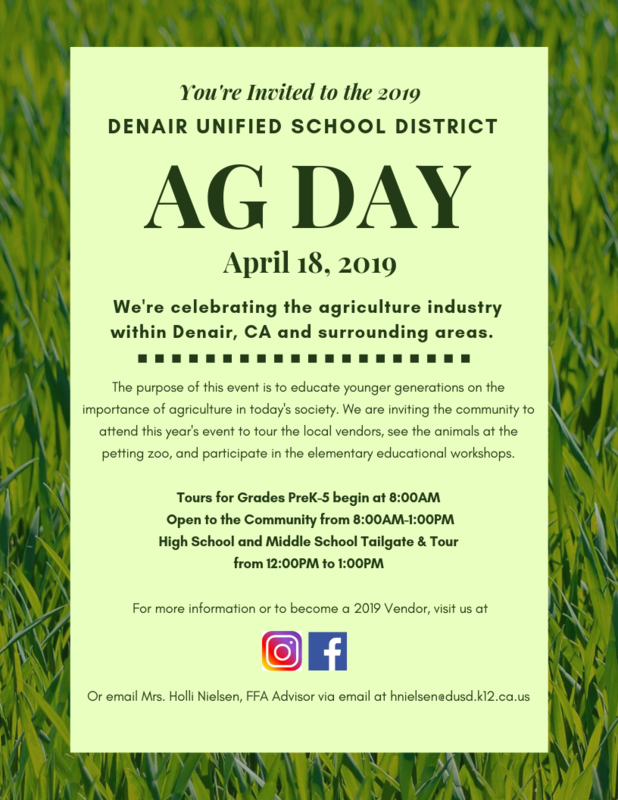 From 8 a.m. to noon, the activities around the high school campus will be led by members of the Denair FFA Club and Associated Student Body leadership team. High school students will welcome more than 500 younger children from Denair Elementary Charter Academy and guide them on a series of fun, hands-on tours. One will focus on floral arrangements and principles. Youngsters will be able to decorate writing pens that they can take with them. A second tour will allow elementary students to milk a fake cow designed by a Denair High art class and fill up milk cartons donated by Crystal Creamery. The final lesson will enable children to build “soil” layers with candy and cereal in clear cups that they can take home. At noon, the elementary students will return to their campus and Denair Middle School students will arrive to enjoy a barbecue with their high school counterparts. There also will be booths highlighting various ag and non-ag careers, and a petting zoo featuring horses, heifers, hogs, sheep, goats, chickens, and rabbits for students to enjoy.